An exclusive wedding, set in a timeless place, to feel like king and queen at least for the wedding day: we reveal you 6 reasons to get married in a castle. 2. THE CHARM OF A DIFFERENT AGE - other couples, however, choose a fortress because conquered by the majesty of the architecture, the centuries-old stones and fireplaces, the precious mosaics and frescoes that decorate the rooms, or even by the beautiful gardens. You will become part of the history that those ancient walls enclose. 3. STUNNING LANDSCAPES - In Italy there are a lot of castles of every century and they all are located on the hills, surrounded by breathtaking views. Whether the venue is in the countryside or it overlooks the sea, suggestion and perfect photos are guaranteed! 4. FABULOUS WEEKEND - If you want to try a real experience with your guests, choose a manor that has rooms available or that is sited in a real Medieval borgo. In this way the wedding will become a weekend in a fabulous location. You will have the opportunity to spend a few days out of time, in rooms that may have kept the original furniture or been revisited in a modern way: in any case, it will be an adventure to tell! 5. UNIQUENESS - choosing a castle as venue, surely you will differentiate your event from most weddings. 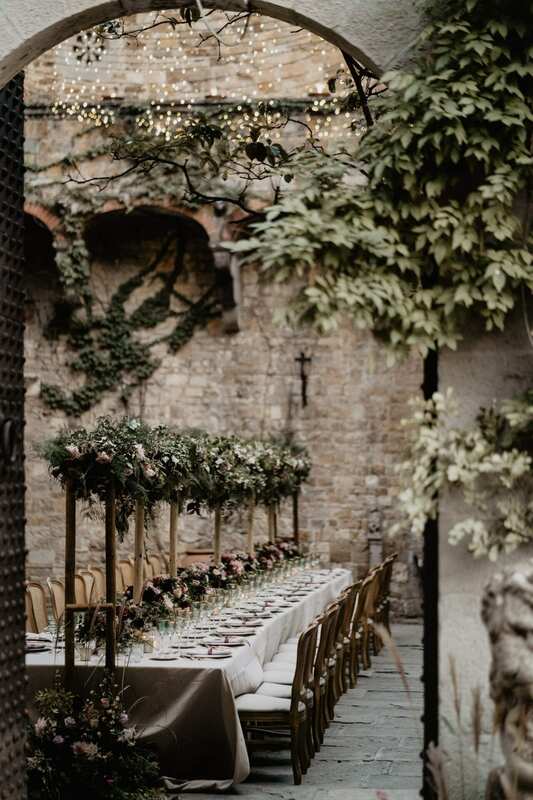 Exclusivity is also given by the possibility of using different spaces for different moments: the courts can host the dinner or the party, while in the garden the civil or symbolic ceremony could be celebrated, not to mention that the interiors are perfect in case of plan B. If you are lucky, the chosen castle could also have a small private church where to celebrate the Catholic rite. 6. THEME ENTERTAINMENT - it may be interesting to experience a few minutes in the era that "hosts" your wedding. Flag-wavers, minstrels, portraitists, jugglers: there are many options to entertain guests. Do you wish to organize a fairytale wedding? Contact us and together we will find the castle suitable for your event!